The Eve Tribal Belly Dance Company has been an active tribal fusion belly dance troupe in Central Massachusetts known for their innovation and complex, multi-layered movements since August, 2006. To celebrate our 10th anniversary this year we will be hosting a fabulous day of classes, crafts, vendors, and performances; followed by an evening Masquerade Ball on Saturday November 19th at the New Players Theatre in Fitchburg, MA. This event is a fundraiser to benefit Sterling Animal Shelter: a nonprofit, no-kill animal rescue organization. This is a fun, low impact class perfect for people with no previous experience. The first 20 attendees will be graced with a lucky bindi and colorful hair flower as well! We breakdown each move slowly with in-depth demonstrations. Drop-In and dance! 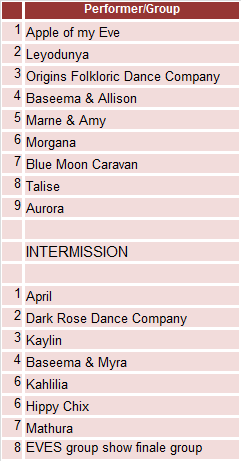 From the welcoming entrance, to lyrical veil work, to the sultry chiftitelli, leading in to the exciting drum solo, and ending with the finale, the American Cabaret 5 part routine is a classic. Let's explore each of these and some of the typical movements used to express each part. American Tribal Style® Belly Dance is a modern style of belly dance created by Fat Chance Belly Dance® director, Carolena Nericcio-Bohlman. It is a transnational fusion dance with elements from the Middle East, North Africa, Spain, India, as well as other countries. ATS® is group improvisation where a vocabulary of movements and cues are used, allowing the dancers to create art in the moment. ATS® is fancy steps, exciting music, and sheer beauty of people dancing together as one! Join us as we learn some of our favorite dance combinations. You’ll be dancing before you know it. This workshop will feature breakdowns of several different types of shimmies, techniques, and layering drills to help dancers fine-tune and expand their musical expression. 3:30 pm - David Drumhead Curry! Drum Circle!!! This is open dance time. Come to shake some more shimmies, to get your gooey moves limber for the performances later or to just enjoy the drums as you move. Included in the cost of registration: Join us for an open dance Masquerade! Bring and wear a mask or show your true face and celebrate our birthday in dance-tastic style. Please note that we are no longer accepting applications for performance spots. Music will need to be provided at check-in on a CD (but please also have a back-up version on a digital device). Registration covers: performances, access to vendors, all dance classes, and entry into the Masquerade Ball in the evening. Free parking is available in the RBT Bank lot across the street and under the billboards. There is some on street parking at the end of Rollstone Street (about 25 feet after the theater). PLEASE NOTE: The Methodist church does not allow us to use their parking. The NPTG Center for the Performing Arts is fully accessible. Please note that we are no longer accepting applications for vendor spots. Handsewn Funky Critters for both young and old! No 2 are ever alike. They're very affordable and right now are perfect for holiday stocking stuffers!! Get your picture in a gorgeously done up bellydance set! 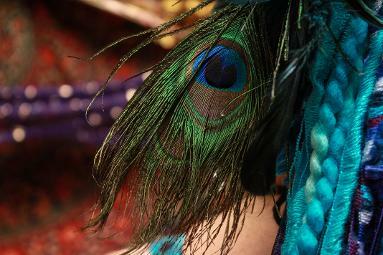 Bellydancers will be on-hand in costume to join for pictures throughout the day!